The Tanaka 3 piece pipe was designed specifically for Tanaka engines used on Tanaka's Tanaka Paverunners and Bladez's Bladez Mobys. With minor modifications, this pipe has also been mounted on Active engines. 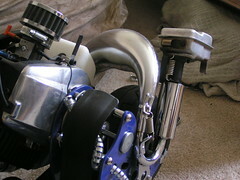 When it comes to mounting a Tanaka engine on a Bladez or Takana scooter, this pipe can't be beat. Its performance is comparable to the similarly styled Bladez 3 Stage Pipe but will out perform the Bladez pipe in both torque and top speed. 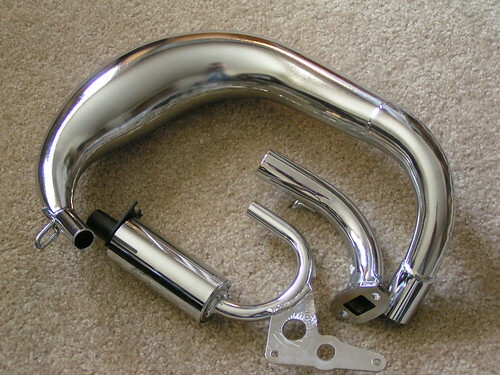 This pipe includes a muffler adapter to fit on the end of the stinger in order to silence the engine. In most cases, mounting the muffler on the end of this pipe has produced and increase in performance. 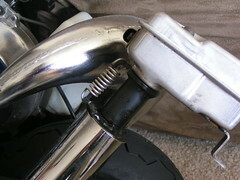 This pipe was designed specifically to be used on Bladez and Tanaka scooters. 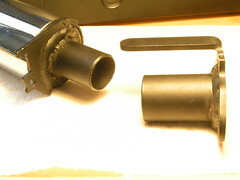 You can see this most specifically by the shape the on the end of the pipe which includes the silencer and stinger. 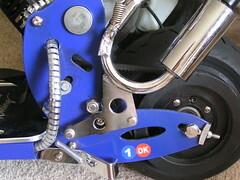 The two smaller holes line up precisely with mounting hold on the transmission of these scooters. The pipe itself is quite a tight fit as it fits just above the back wheel. Though it make appear so, this pipe will not fit on an Evo 2 or 2x. Since this pipe bolts to the scooter from both ends, it is extremely secure. It is unheard of for this pipe to rattle free when properly installed.